When I was a kid, my parents went on vacation and left us home. They brought back two identical, but differently sized, turquoise blue with white fringe cowgirl skirts and vests, holsters and six shooters. My sister was about three and my cousin and I were almost 6. My cousin already had a similar red outfit. We loved them and played cowgirls and bandits all the time. If a friend came over, they would get to be the Indian and use the bow and arrows with rubber suction cup tips. But the Indian wasn’t the enemy. He or she simply joined us to fight the bandits who were robbing the bank. Or ended up taking his or her turn being kidnapped by the bad guys and eventually rescued. The bad guys were always virtual. That was our view of the world and weapons. Looking back, we probably watched too much Hopalong Cassidy and Roy Rogers. Later on I actually practiced archery and by college was pretty good at using a short bow, but then the fancy, compound bows became popular and I lost interest. But, when I saw an issue of Evolutionary Anthropology devoted exclusively to bow and arrow technology in North America, I was intrigued. And then I noticed that two of the papers were by Penn State archaeologists. It didn’t surprise me at all that George Milner, professor of archaeological anthropology and head of the department had a paper in the journal. He was my dissertation advisor and he studies Cahokia in the St. Louis area and warfare among other things. His paper looks at intergroup conflict in Eastern North America and includes analysis of changes in population intensity, technology and the natural environment. One of the technologies is the bow and arrow. Contrary to popular belief, people in North America did not always use bows and arrows. Through the end of the Pleistocene (whenever humans came to the new world) and through most of the Holocene (about 12,000 years before now), people used hand thrown spears or spears thrown using spear throwers — atlatls. The bow and arrow was in use in Europe at least 11,000 years ago, but not in North America. In the Southeast at least, the bow and arrow appear in the later part of the first millennium, somewhere between 800 and 1,000 CE, maybe. This is before maize agriculture and the rise of chiefdoms but after an increase in the use of native plants. So, economic intensification is not attributable to the bow and arrow as others suggest, but this new technology is used for hunting, and also for fighting. Evidence of fighting shows up in arrowheads embedded in bone around that time, but it isn’t until some time later that defensive works such as palisades became common. Douglas J. Kennett, professor of environmental archaeology and human behavioral ecology, looked at the bow and arrow in prehistoric coastal California, where it appeared in the Santa Barbara Channel region sometime between 650 and 900 CE. He notes that bows and arrows did not immediately trigger intergroup warfare, but that it did contribute eventually to intergroup conflict and hereditary inequality in the area. In neither case is the introduction of this new technology the main cause of social and economic change, but combined with other things — population increase, increased sedentism –it probably played a part. One problem with looking at bows and arrows in prehistory is that the bow and most of the arrow tend to decompose over time. 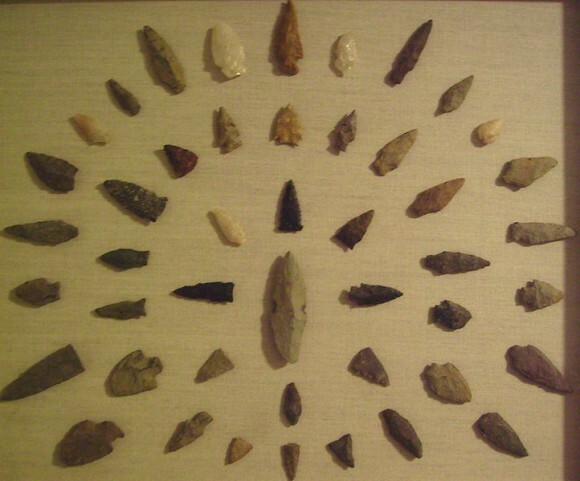 Wood and sinew cannot last through the ages, but the stone arrowheads can. Archaeologists tend to call them projectile points, because it isn’t always obvious how they were used. Yes, the smaller points are probably arrowheads and not spear points, but it isn’t always clear. We think of the bow and arrow as ancient technology, and it is. And it was at various times important technology. The introduction of the English longbow in the Middle Ages during the Hundred Years War was incredibly important, especially during the Battle of Agincourt. There are still some groups that routinely use bows and arrows to hunt and of course, there is a bow-hunting season in Pennsylvania. Archery, using those modern, complicated compound bows I dislike, is an active sport and part of the Modern Olympics. A far cry from the cowgirl outfits and rubber suction cup tipped arrows of my childhood.